A tiny island sits almost four hundred miles from the Eastern coast of Australia. Upon that island once lived a large population of giant stick insects—six inch-long “land lobsters” dwelling in trees—the Dryococelus australis. But a hundred years ago, mankind came along, bringing pests, black rats, with them. The bugs went extinct at the hands of the rats. But climbers at nearby Balls Pyramid, a jagged crag jutting straight out of the water, spotted a fresh D. australis carcass on a climb during the 1960s. Another survey of Balls Pyramid in 2001 found a few specimens alive on a tree, and a 2002 survey found even more. But the bugs on Balls and those on Lord Howe look completely different, leading scientists to wonder: had they truly found the extinct species once again, or had they stumbled upon completely different animal? The differences between the old and new specimens are obvious, though. The older, supposedly extinct bugs were thicker, with thicker rear legs (C) and differently-shaped cerci, the pair of appendages at their rear (B). Researchers had other reasons to believe that they were looking at a new species, too. It wouldn’t be the first time different species evolved to look the same. Or maybe the two bugs could have once been the same species but were separated by distance for so long that evolution caused them to diverge. These days, figuring out if two animals are the same requires an understanding of their genomes—the specifics of their DNA code. 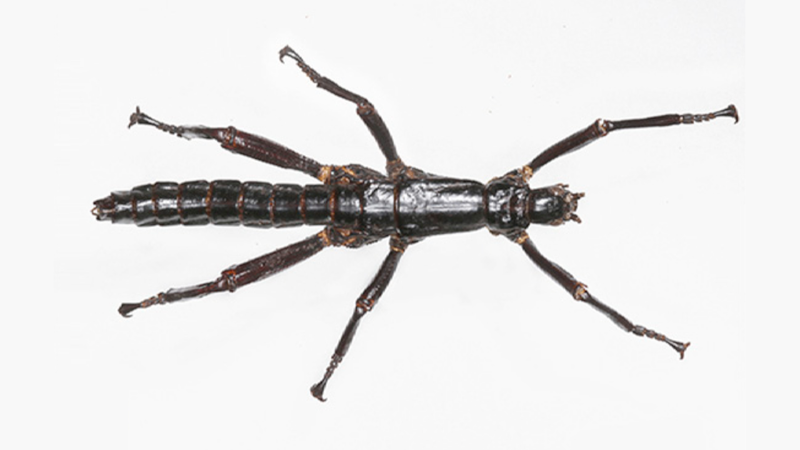 Stick bugs are an especially challenging species to sequence as they have enormous genomes, with several billion base pairs (the DNA letters), according to the new paper published in Current Biology. But after analyzing both specimens from museums and specimens from Balls Island, the researchers had their answer. The DNA differed by less than one percent, “suggesting that the two populations most likely diverged after the origin of this species and not long enough ago for speciation to have taken place.” The Balls Island bugs were Lord Howe Tree Lobsters. Better understanding the species is important as researchers hope to one day reintroduce it to its once-native habit. A rat killing program is scheduled to begin on Lord Howe Island in 2018 with the reintroduction to follow. If the genetic analysis had turned up a different species, then the researchers would be introducing a new species to the island, not reintroducing an old one. That’s a completely different story which could potentially lead to unforeseen ecological problems if the species is brought to a place it doesn’t belong. All of this goes to show just how useful museum collections can be to science—knowledge gleaned from an old, dead bug could potentially save its entire species a hundred years later.